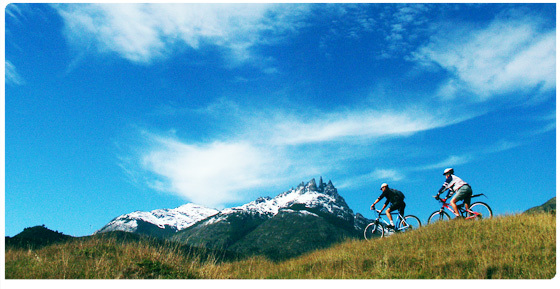 Fourteen Day Mountain Bike, Multisport Safari Vacation in Chilean & Argentina Patagonia. Route Includes: San Carlos de Bariloche, El Bolson, Esquel, Puerto Montt, Osorno, Choshuenco & San Martin de Los Andes. Arrive in Valdivia, Chile on the early afternoon flight where you are welcomed by the Expediciones Chile staff. It will be, roughly, an hour drive to the small village of Panguipulli, known as The Village of Roses, on the shores of Lago Panguipulli. Our hotel this night is a quaint lodge located lakeside providing awe-inspiring vistas. We drive outside town and those that want to raft put in at the Rio San Pedro. This clear and warm river is our introduction to big white water. Mountain bikers will start riding on the winding gravel road along the lake to the remote lakeside town of Choshuenco. The rafters will catch up to us by the safari mobile. Choshuenco takes its name from the volcanic snow capped peak overlooking Lago Panguipulli. Our comfy cabanas and inn is situated on the sandy beach of this sparkling warm lake. We have dinner on the porch overlooking the beach. Today we ride our bikes on a abandoned four wheel drive road as far as we choose around the back side of the undeveloped Lago Panguipulli. Ride as far as you choose to. You can return in time to enjoy a little relaxation on the beach. After a hearty Chilean breakfast we are bound for the complete ascent of the snowcapped Volcano Choshuenco The view is stunning, overlooking the valley, lakes and rivers below. When we return off the peak if you have enough energy you can ride your mountain bike back to the village. Departing at 8:00 am you will be back on your lakeside accommodations at 4:00pm. There are other mountain bike options if you do not want to trek today. We ride up to visit the huilo huilo water fall a spectacular 100 foot water fall. From there we ride several miles further to Lago Fuy. Where you can take a cooling off dip in its transparent cool waters. The entire ride back is down hill so enjoy it. You return to cocktails on the deck overlooking the beach. Today is a travel and tour day while we travel to our next destination. We pack up the safari mobile and trailer as we depart early to a remote ferry crossing of Lake Fuy high in the Andes. After getting our passports stamped we drive down off the mountain into San Martin de Los Andes in Argentina an Andean resort town. Here we eat lunch and take a turn on to a rarely traveled gravel road through a desert in the rain shadow of the Andes. The bizarre eroded formations will make you get your camera out. Departing the desert we arrive on the shores of Lago Nahuel Haupi home of the sparkling city on the lake, Bariloche. We check into our Hotel in the city center and eat at one of the best restaurants in town. This night experience the Argentinean night life. This is a big day. After breakfast we drive 1.5 hours south to the Rio Manso in National Park Nahuel Haupi. Again there is an optional raft day or ride down the river on a dirt road. This class 3/4 gorge has engaging whitewater action. We traverse the national park where we will see ancient Alerce trees. We take out on the border of Argentina with Chile. The trail takes us to the border with Chile. Here we have lunch at a real working ranch. After the days activities we load up our safari mobile and drive deeper into Patagonia with a quick stop at the artist community of El Bolson. Now the drive takes us out into the desert caused by the rain shadow of the massive Andes near Futaleufu. By nightfall we arrive at a remote farm house converted into a bed and breakfast situated in Argentina just a few miles from the Futaleufu River and the border with Chile. Our Argentine hosts will be waiting with a full on Asado prepared just for us. The stars are nothing short of spectacular. After a super breakfast with eggs and home made bread and jams. We begin today's ride by heading downstream along the Futaleufu river on section of the only paved road in our region. We start through green rolling hills and ranch land. Within several miles we depart the paved road and start on the gravel road and enter a deep black rock gorge. Our trail is cut into the side of the canyon, giving a bird's eye view of the restless, radiant turquoise Futaleufu River below. Several miles later the gorge opens into the remote Las Escalas Valley. We will ride across this enchanting valley and enter an old growth, temperate forest of Coigue trees. Coming out of the forest, The ride leads us to a 136-acre working ranch set deep in the forest, overlooking the river valley below. Apart from the spectacular views, this self sustainable ranch, without road access or electricity is a marvel in its own right. There, you will be greeted by our host at a rustic wood crafted ranch that functions completely off the grid. You will get the full tour around the ranch, before sitting down to a feast of traditional Chilean cuisine. After dinner you can watch the owner spin his own wool and browse through his hand made products, before settling into your comfortable sleeping quarters. Enjoy a warm night's sleep in comfortable, homemade beds as you look forward to a bountiful breakfast and your ride to camp the following morning. After a full breakfast, say goodbye to your Chilean hosts as we ready for the second part of our Futaleufu Valley mountain biking week. The Futaleufu Valley trail continues downstream, rejoining the Futaleufu River. You will be able to ride to an overlook of the powerful Class V "Throne Room" rapid. This Class V + rapid is a whitewater power storm blasting through a narrowing in the canyon walls. After viewing this maelstrom from a cliff above, we will have lunch on a gravel beach on the side of a huge calm pool below with excellent fishing. The trail continues with beautiful green meadows and spectacular vistas of the rugged mountains. We arrive at perhaps the climax of beauty at the confluence of the Rio Azul and Rio Futaleufu. Here under the gaze of the Tres Monjas (Three Nuns) peak we will stay at our luxurious Patagonia Eco Camp. White sand beaches welcome us after we cross the Azul in tandem canoes. We will camp here for the night and enjoy the sauna, hot showers, masseuse and sit-down dining. Mountain bike riding in Chile doesn't get better than this! 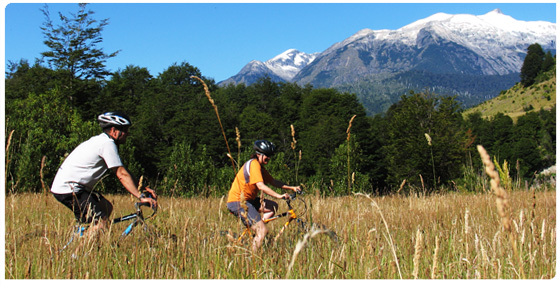 We can choose to hike or bike our way to the Futaleufu put in. We jump in the rafts for an outrageous whitewater experience on the heart of the Futaleufu river! This is the most action packed section of whitewater - a virtual whitewater power storm! 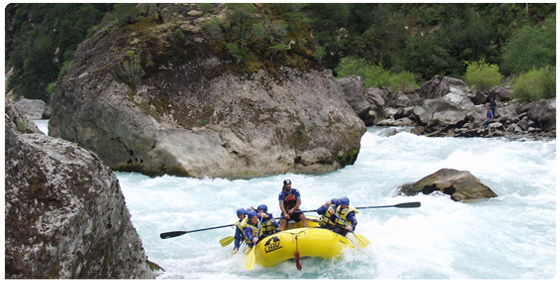 This section, from the Zapata swinging bridge to the Puente Futaleufu, includes five miles of Class IV+ rafting action. Rapids such as "Entrada", "Pillow", "Tiburon", and "Mundaca" with its must-see explosion hole, will keep you on your toes. This Class 4/5 section prepares us for the sections we have yet to do. As if this highly charged river trips wasn't enough, we'll take out in one of the most gorgeous sections of the Futaleufu, the Macal section, after we have ample time to soak in the beauty of snow capped mountains, glaciers and pristine forests on the lower section. After the trip we return to our Camp and take advantage of our sauna and massuse and work out any sore muscles you might have after a big day of paddling. Today we ride toward the backside of campo's soft pastures and head up through the spectacular glacier ringed Rio Azul Valley arguably the most spectacular views the amazing valley offers. Crossing the Rio Azul on a swinging bridge we head upstream as far as we choose to ride. We see the Rio Azul and its different moods of whitewater with exotic ferns and greenery along the river. We return to camp on the other side of the Azul and we cross in Canoes to get back to camp. Today we ride again toward the spectacular glacier ringed Rio Azul Valley but shortly we turn on a seldom used road towards the the far side of Lago Loncanao. This ride is spectacular; beautiful vistas, everything you imagine when picturing Patagonia! We come on to a bigger gravel road for our ride along the Lago Lonconao. After a spectacular view overlooking the lake we depart to a seldom used road that crosses the Rio Espolon on a rustic swinging bridge. Here we can walk up and view a tremendous Class 6 waterfall exploding in a white froth out of the upper lake into the valley blow. This is a sight to behold as we eat lunch over looking what is called the Devils throat. Afterwards we ride along the Espolon and enter a trail to the hidden secret Lagoon where we will take a break. If it is warm this day we can swim in its crystal clear waters. We continue riding down the Espolon river toward the village of Futaleufu. Upon arrival in the village of Futaleufu, our luggage will join us. We check into a little bed and breakfast and enjoy dinner in this cute little town nestled in the mountains. Today we're headed across the border with our bikes and into the Welch city of Trevelin. We have a choice of two different rides one for advanced riders that enjoy exploration along the upper Futaleufu river coming out of the Argentine National Park Los Alerces. The other through rolling farm land, cross the upper Futaleufu until we make our way across the Andean Steepe. At the end, we'll reach civilization and have the chance to take advantage of the wonderful quality of life Argentines have manage to maintain. We'll check into a unique hostel and enjoy beautiful scenes of the Andes before we enjoy a nice dinner in town. Check into your hotel, take a shower and change clothes before enjoying your last night in Patagonia. There are a handful of outstanding and reasonably priced restaurants in Trevelin that we can recommend. Relax, recover and look back on the exciting week of rafting before heading back the following morning. Depending on your connections you are now are in Argentina ready for an early departure in a cab from you hotel to the bus station in Esquel for the trip to Bariloche and your flight back to Beunos Aires. A private transfer can be arranged direct from your hotel to the airport in Bariloche. If you have a flight from Esquel you may have a leisurely morning to enjoy and buy gifts in Trevelin before your late morning flight to Buenos Aires and the connection back to your home country. Not Included: Transportation to and from your home town, and your accommodations and meals in Trevelin, Argentina or alternate trip pick up point. You can reserve and prepay on the web for your transport from your final air destination, to and from your pick up/drop off point before and after your trip, or you can direct us to charge your visa card and do it for you. We higly recommended having exchile make hotel reserves in Trevelin. (room capacity in this small village is limited). Expediciones Chile is not financially responsible for your travel complications getting to your trip pick up point and from the drop off point, HOWEVER, we will be relentless allies in offering our services to help solve any issues that you may encounter. con las mejores aguas blancas de clase mundial (5,4,3,). Kayak de mar, mountain biking, cabalgatas, sit-on-top kayaking cayoning, caminatas, pesca con mosca y mucho más aventuras podrás encontrar en el corazón de la patagonia Chilena, y desde el comfort de nuestro nativo y caluroso Hotel. Rafting en el Río Futaleufú en Español.